Neptune Towers, Kingsgate’s Bay, Kent. 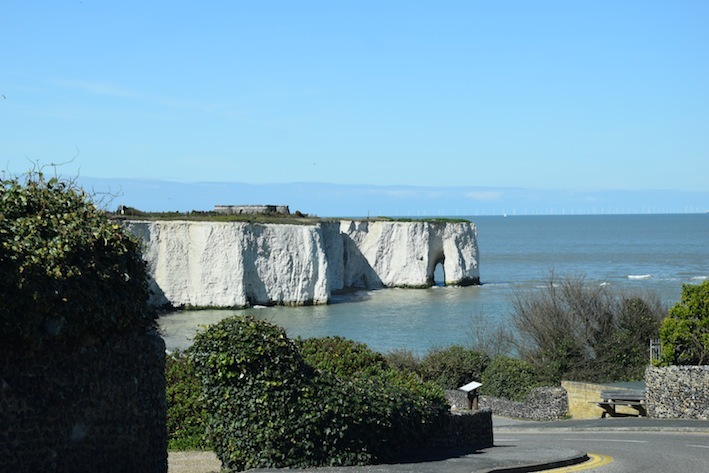 Quite a few years ago we lived in Kent, and I have seen this view many times, but this was the first time I noticed the ruins on the cliff, when we were visiting family on Easter Sunday. I can only guess that the white cliffs take your full attention, or it could be just me, not seeing what’s under my nose. The bay is called Kingsgate and is just outside of the seaside resort of Margate in Kent. At first I thought it was the remains of a fort or castle, but it’s a folly…….. Neptune Towers stands on the cliffs at Kingsgate, next to a golf course, the folly was built at around the same time as Kingsgate Castle, by Lord Holland in 1760, which is just a little further along the cliffs. It was constructed in the shape of a typical Henrican castle but on a much smaller scale, with four bastions and a tower in the central courtyard (demolished in the 1970’s), the footings of which can still be seen. The tower was used by the Royal Observer Corps as a look out post during World War II. Apparently Lord Holland built several follies around his castle, but Neptune Towers, which was called Arx Ruochim and it is said to have replaced a tower erected here by King Vortigern in 458 AD. Maybe that is the reason why Lord Holland built the folly, also it did have a large tower in the centre, now long gone. There are not many details to be found on the building, but as it is a folly there would be very little. It makes perfect sense that you would see those amazing cliffs rather than the low profile folly on top off them. It is a beautiful sight. Lovely pics! I have only seen the ‘white cliffs’ once. I love the arch in the cliffs too! 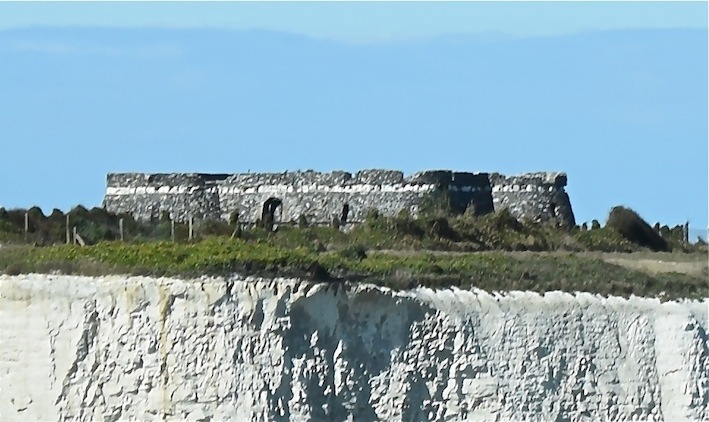 As per your notes, the folly, built by Lord Holland in the late 18th Century, was apparently called Arx Ruochim and constructed in the style of a Henry VIII coastal fort in Walmer/Deal. Lord Holland added to the myth by claiming that the folly was built on the site of a tower built by King Vortigern in c. 458 AD. ( British Library, online gallery, Ruins at Kingsgate in the Isle of Thanet). 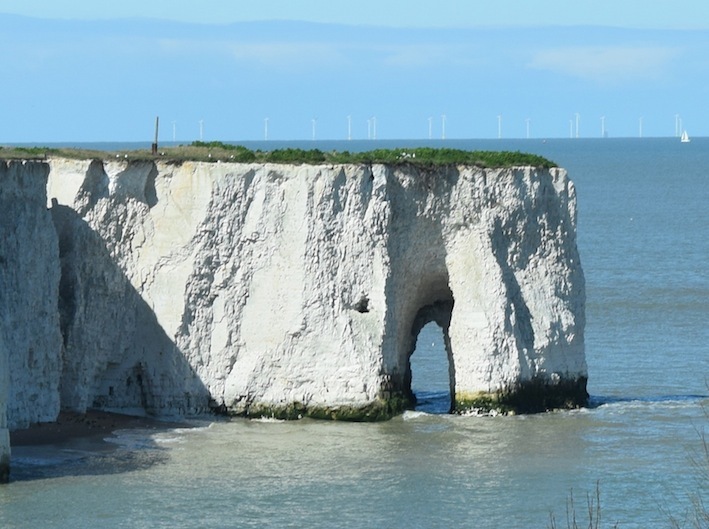 However, the location of this folly is on the cliff top above Kingsgate Bay, nestled between Botany Bay to the north and Joss Bay to the south. St. Margaret’s Bay is a location favoured by cross channel swimmers but is just north of Dover, some 20 miles down the Kent coast from Kingsgate Bay.